Lakshadweep is an archipelago of Islands, which are nestled midst the endless Arabian Sea. The archipelago comprises of 36 main islands, many smaller islands, coral atolls and coral reefs. These coral reefs give each of these islands and the sea around them, a unique colour and beauty. Out of 36 islands, only10 islands are inhabited, namely Agatti, Amini, Andrott, Bitra, Chetlat, Kadmat, Kalpeni, Kavaratti, Kiltan and Minicoy. Built on ancient volcanic formations, Lakshadweep is the tiniest Union Territory of India with 12 atolls, 3 reefs and, 5 submerged banks. An inviting holiday destination for nature lovers, Lakshadweep is known for its lush green landscape, incredible marine life, soft silvery beaches and water sports. Loaction : Off kerala coast between 8 0 and 12 0 North latitude and 71 0 and 74 0 East longtitude. Number of Islands : 36 Islands out of which 10 are inhabited. Tourism in Lakshadweep is the fastest growing industry, which is playing a vital role in generating income, employment and over all development of islands. Lakshadweep tourism is mainly nature based which includes pristine beaches, rich flora and fauna, and marine life. These beautiful islands allure thousands of tourists every year from various parts of the world. For the promotion of tourism in Lakshadweep, the tourism department of Lakshadweep has come up with various plans, which include construction of hotels, development of infrastructure, conservation of heritage monuments and development of new tourist destinations. Lakshadweep tourism offices are located at various cities of the country, which provide travel related information about Lakshadweep. The official website of Lakshadweep tourism gives out ample information about this beautiful destination. Besides, Lakshadweep Tourism Board also offers exclusive holiday packages to different Islands of Lakshadweep, which include transfers, comfortable accommodation, all meals, and sightseeing and water sports activities. Tourists can also avail specialized Lakshadweep tourism guides at any of the islands. Lakshadweep with its vast stretch of white sandy coastline has emerged as a water sport destination in the country. Understanding the immense potential of water sports, Lakshadweep Tourism board has been has been concentrating on developing the water sports facilities. The Department has set up a full fledged Water Sports Institute at Kamat Island which offers facilities for canoeing, yachting, Kayaking, snorkeling, wind surfing, water skiing, and scuba diving. The ideal time to visit Lakshadweep Islands is between the months of October to April when the weather is most pleasant and surrounded Arabian Sea is pure Aqua. The tomb of Hazrat Ubaidullah, mosques of Kavaratti, Kavaratti Aquarium, Buddhist archaeological museum, and the Tuna Canning Factory are the major tourist attractions in Lakshadweep. Lakshadweep Travel destinations include Kavaratti, Minicoy, Agatti, Kalpeni, and Bangaram. 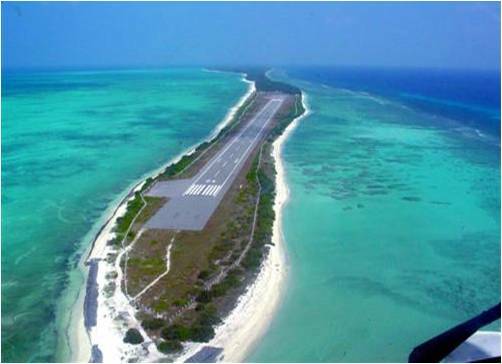 Travel to Lakshadweep by Air: Lakshadweep Islands are 400 Kms far in the west coast of Kerala. There are regular flights that run between Agatti Island and Cochin or Kochi in Kerala. Indian airlines and Kingfisher Airlines operate flights to Agatti Island six days in a week. Helicopter transfers are also available from Agatti Island to Bangaram Island Resort during monsoon and to Kavaratti through out the year. Travel to Kerala by Rail: Kerala has around 2000 railway stations, which connect places both within and outside Kerala. Many long distance express trains connect all prime cities of Kerala with Delhi, Mumbai, Chennai, Kolkata, and Goa. Travel to Lakshadweep by Sea: Ship cruises operate from Cochin to Agatti and back. "SPORTS" is the official agency that conducts exciting cruises to Lakshadweep. Four passenger ships M.V Tipusultan, M.V. Bharatseema, M.V Aminidivi and M.V Minicoy operate between Kochi and the islands. All ships have air-conditioned cabins and air-cooled decks. Inter island transport is provided by Helicopter, Ships, Ferry vessels, and Mechanized boats. Auto rickshaws and private cabs can be hired in Lakshadweep at nominal rates.